Modern day Saudi Arabia was established in 1932 after the unification of today’s whole area of Arabian peninsular which is under the rule of al-Saud family. Modern Saudi Arabia can also be called the Third Saudi State because two Saudi states were also established previously in the 18th and 19th centuries. The emergence of power by the Saudis is mainly based on the Salafi ideology of Islam which is quite similar to Puritan faith of Christian religion. Muhammad bin Abdul Wahhab (1703-1792) was a famous preacher and religious scholar of Najd (central Arabia). His teachings are mainly based on the Islamic beliefs while the emphases are on tawheed (monotheism) and rejection of shirk (polytheism), bidah (innovations in Islam) and supplication from anyone except Allah. 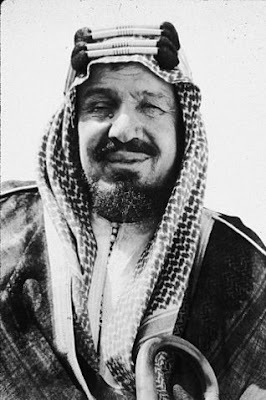 His religious ideology was accepted by the Ibn-e- Saud family and both the families made an alliance under which Ibn Abdul Wahhab will accept the political supremacy of the al-Saud family in the areas occupied by them and the al-Saud family will accept the religious authority of Ibn Abdul Wahhab family (known as al-Shaikh). The ties were further strengthened by mutual marriages. The alliance proved fruitful and the First Saudi State was founded in 1744 which comprised the modern Saudi Arabia and few other neighboring countries. The Ottomans ended this First Saudi State in 1818 with the help of their viceroy in Egypt. In 1824, Saudis were able to form the Second Saudi State but it was limited to the Najd area around their stronghold Diriyyah. This time, the Al Rashid family of Najd defeated them in 1891 and the Saudi were forced to exile in Kuwait. In 1902, the formation of the Third Saudi State started with the recapture of Riyadh by Abdul Aziz bin Saud (also known as Ibn-e-Saud). Ikhwan (brotherhood) was a tribal army of Najd, known for their religious zeal and bravery, which was founded in 1912. This religious force helped the Saudis to capture Al-Hasa (eastern region of Arabia) in 1913 from the Ottomans. In 1921, Saudis and Ikhwan defeated the Al Rashid family and became the sole rulers of the central Arabian area of Najd. Hussain bin Ali (known as Sharif of Makkah) revolted against the Ottomans during the World War 1 with the help of British Empire. His aim was to form a united Arabian state but the Saudis defeated him in 1925 and took control of the area of Hejaz. Later, the Ikhwan also became nuisance for the Saudis as they tried to expand the religious ideology to the states under the protection of British including Kuwait, Iraq and Transjordan. It was like declaring war against the superpower British Empire and thus not accepted by the Saudis. This and few internal matters turned the zealous Ikhwan against the Saudis and this tribal army was completely defeated at the Battle of Sabilla in 1930. In 1932, the areas of Hejaz and Najd were unified to form one state which was named al-Mumlikaht-ul-Arabiyah-as-Saudiyah (Kingdom of Saudi Arabia or KSA). King Abdul Aziz bin Saud became the first ruler of Modern Saudi State. Modern day Saudi Arabia was founded on the basis of radical Sunni Islam (Salafism or Wahhabism). Modern Saudi state was also fortunate that large reserves of oil and petroleum discovered in 1938 while the commercial oil production started in 1941 by ARAMCO (Arabian American Oil Company). This wealth helped the Saudi state not only to give prosperity to nation and its citizens but it also make it possible for them to spread the Salafi ideology of Islam in other Muslim and non Muslim countries. In the 1980s, Saudi Arabia increased its influence rapidly and passionately after the occupation of Afghanistan by Soviet Russia and Revolution in Iran (formation of Shia religious authority in place of a secular monarchy). The latter event resulted in sectarian conflicts in Muslim world with Saudi Arabia and Iran became leaders of opposite sides and the conflict is quite evident now in Iraq, Syria and several other countries. The emergence of al-Qaida and ISIS (Islamic State of Iraq and Syria/Sham) in the modern time is also the outcome of these religious and sectarian conflicts. Saudi Arabia used its wealth and religious authority to influence Middle East and other parts of the world. In different conflicts of Muslim world, Saudi Arabia played important role including Arab Israel wars, Soviet Occupation of Afghanistan, liberation of Bosnia from Yugoslavia etc. Saudi Arabia has also played important role in spreading of Islam in non Muslim countries and purification of Islam from un-Islamic rituals present in different Muslim countries.